Just a few parents know that the first 6 years of a child represent an important period from the point of view of acquiring knowledge and acquaintances. Many of them think that the child is too small to learn. However, just think about how much a child can learn by watching TV. Kid’s curiosity, the desire to explore, investigate and learn are the essential elements of this period. The importance of early childhood has already been highlighted by Maria Montessori (1870), an Italian doctor, who worked with preschool children during her studies. Children until 6 years of age have an extraordinary mind. Montessori called it “absorbing” because of its ability to absorb, learn and store large amounts of knowledge without effort. Little children in their early age gain information from their surroundings, especially through senses. Because of this, it is important to put emphasis on the sensual education in this age. Unlike the opinion that kids are messy, Montessori indicates that They can spend a lot of time by sorting, organizing household objects into rows and columns. They insist on the arrangement of everyday activities, which help them with the orientation in time and space. Disordering and constant changes evoke feelings of chaos and uncertainty. Appropriately chosen teaching methods from birth to 6 years highly influence the ormation of personality. Since an early age, children try to copy what adults do. They want to take part in housework and learn everything without the assistance of adults. They love real things and because of this, they like to sift, to pour, to set the table, to fold napkins, to button up, … They learn to concentrate. Here are 4 areas of activities: caring about myself, caring about the surroundings, movement control, and social life. 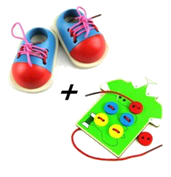 Learning through the senses helps to develop concentration and coordination. The exercises apply to all senses. They are focused on development of visual perception – spatial orientation, distinguishing of colour, size, auditory perception, the development of touch – distinguishing of hard and soft, distinguishing of objects by their weight, development of smell and taste. Sensorial material is also a pre-preparation for learning reading and writing because a child improves movements of hand and fingers and gets ready for holding a pencil. Reading and writing go hand in hand together. 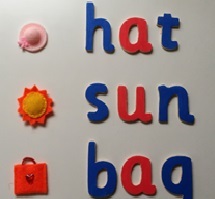 In this phase, a child learns to recognise letters by sight and by touch and at the same time acquires the sounds of letters. Kid learns an alphabet through the “moving alphabet“ and finds out how letters are combined and form words. For children, reading and writing is a fascinating game and they learn with enthusiasm. 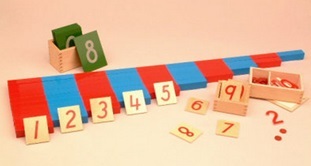 A child learns numbers, develops logical thinking. The idea of the amount is presented in all activities. The beauty of arithmetic lies in the fact that everything can be caught. Understanding is very important here. All experiences get automatically into the subconscious. 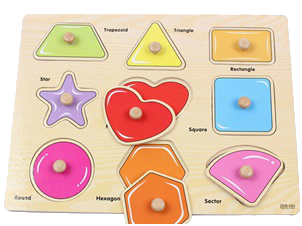 Working with beads, figures made of sandpaper, drawing shapes in for example semolina, all this creates an experience that will stay in child forever and mathematics becomes an easy game. Montessori activities have a specific sequence; they complement each other, develop mental and physical abilities of children and prepare them for life. All these activities should lead to easier acquisition of knowledge in different areas while at the same time, they make the preschool learning more interesting and form independent personalities ready to enter school life.